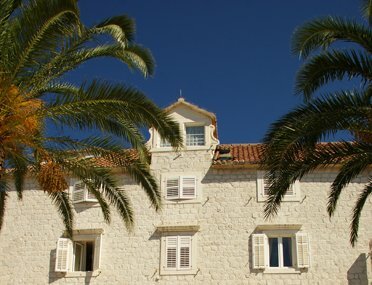 This boutique hotel is situated on the promenade of the UNESCO-protected town of Trogir. Hotel Concordia is set between the Kamerlengo fortress and the St. Dominic Convent, close to many coffee bars and restaurants. Trogir is a charming town with stone paved streets, cosy Dalmatian taverns and picturesque squares. Visit the main street Gradska or explore Pasike, the older part of Trogir, with different types of musical and folklore events taking place. The hotel building is 300 years old, but the interior has been completely renovated and converted into Hotel Concordia. The fully-equipped and furnished rooms boast amazing harbour and marina views. There is a small restaurant suitable for breakfast service and smaller business meetings on the ground floor of the hotel. In the summer time, guests can eat their breakfast on the terrace and enjoy the magnificent view over the sea and the promenade. Other meals are offered at restaurants nearby. Sample Dalmatian specialities prepared with natural ingredients or international cuisine at over 100 eating venues in the Trogir area. Prices from £57 per room per night. Please call us for latest availability and at the best rate.